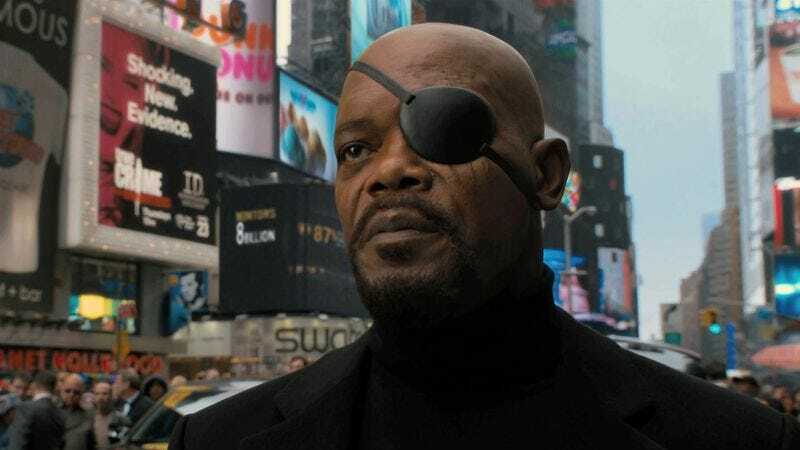 Who he is: Nick Fury, a.k.a. Commander Fury, head of S.H.I.E.L.D. His power: No superpowers, just brains, guts, years of training and experience, and the occasional quip. His story: He spent years as a top agent of S.H.I.E.L.D., a.k.a. the Strategic Homeland Intervention, Enforcement, and Logistics Division. Eventually, he became director, running the international peacekeeping organization after its former head, Alexander Pierce, became a member of the World Security Council. Fury made his Marvel Cinematic Universe debut in a post-credits stinger at the end of Iron Man, where he informs Tony Stark about the development of the Avengers Initiative. He appeared in a slightly larger role in Iron Man 2, again dealing only with Tony. From there, he made appearances in a post-credits stinger in Thor and at the end of Captain America: The First Avenger. He had expanded roles in both Avengers films, first helping defeat Loki’s Chitauri invasion and again aiding the team in coming up with a plan to defeat the sentient AI Ultron. In Captain America: The Winter Soldier, he was attacked and presumed dead when Hydra seized control of S.H.I.E.L.D. He ended up killing Pierce—a secret Hydra agent—and left the agency after exposing Hydra’s activities to the public. He made Phil Coulson acting director of the new, underground S.H.I.E.L.D. after his departure, as revealed in Marvel’s Agents Of S.H.I.E.L.D. Fury eventually came out of hiding during Avengers: Age Of Ultron, pulling an old Helicarrier out of mothballs and using it to help rescue the people of Sokovia from Ultron’s attack. Currently, Nick Fury is: In the wind, to places unknown. Where will we see him next? Currently, the only film Fury seems confirmed to be a part of is the first installment of the two-part Avengers: Infinity War, scheduled for 2018.